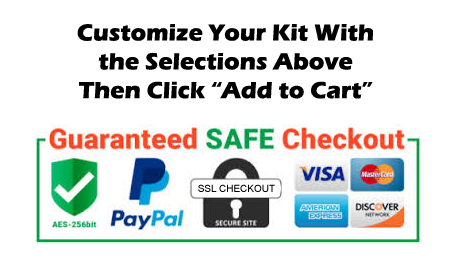 KonFusion Chameleon Motorcycle Paint Kit - Buy Custom Paint For Your Automobile Or Motorcycle At Discount Prices! This kit is generally enough material to paint most bikes. Larger bikes with a full fairing and saddle bags may require a second kit. Chameleon paints are perhaps the hardest paints to apply and inexperienced painters will typically require more paint to complete the project. We sell additional size and kit options to ensure you get the amount you need to complete your project. 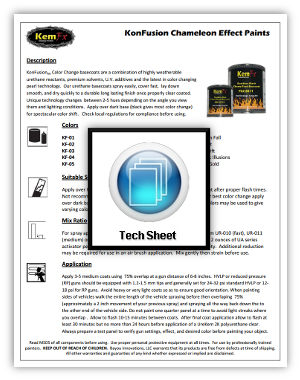 To learn more about our automotive paint kit options in geneneral visit our article on paints kits or to learn more about chameleon paints click here. 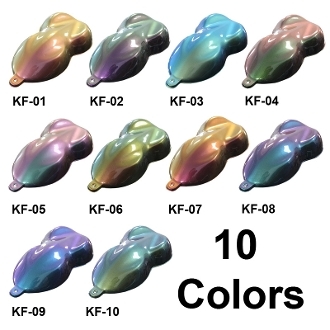 KonFusion chameleon paint is made from durable urethane co-reactants and the latest in Chameleon pearl pigment technology to create a durable basecoat with jaw dropping color change at an affordable price. Using durable polymer resins, high quality pigments, and U.V. 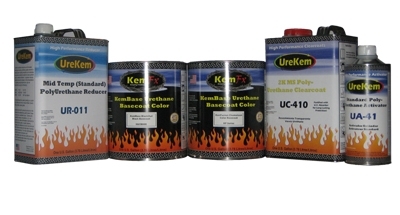 sunscreeners ensures these chameleon paint products will last! The base mixes 2:1 with UreKem urethane grade reducer (included in kit) and the clear mixes 4:1 with activator for the MS clear or 2:1 with the glamour clear. Check local regulations for compliance. This item kit is not compliant for use in areas that require low VOC finishes such as most of California, Maryland, Deleware, Rhode Island and potentially other regions as regulations change. For customers in areas requiring low VOC we offer a low VOC version of these basecoats. Contact us at info@thecoatingstore.com for details. 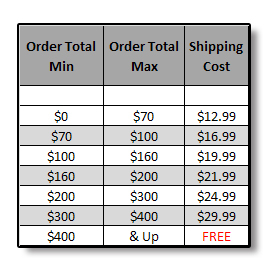 Our unique sales and marketing strategy allows us to save large amounts of money by not hiring a national sales force to distribute our products. Furthermore, we do not have large marketing budgets based off exorbitant costs of race and show sponsorships. This allows us to make a high quality paint and sell it for a low price. The amount of paint depends on a lot of factors but generally one kit will paint the outside and jambs on mid-sized vehicles. Large SUVs or large trucks where you are spraying inside the bed will need additional paint. The experience level of your painter with chameleon paints will play a big role in how much paint is used and the likely quality of your completed paint job. Chameleon colors are hard to paint so choose your painter wisely. What colors to do you see in this chameleon? Thee colors you see depends on how it is applied and your personal color perception. We recommend you choose your color based on how it looks in the photo and video then makee sure a test panel is done and you like it before your vehicle is sprayed. More or less coats of chameleon over the black does effect the final color so you migh want to evaluate test sprays with different numbers of coats of the chameleon to choose your favorite effect. Like the reducer you should choose your activator based on the size of the object you are painting and the temperature. Since this listing is for a car kit we'll assume you are painting a car and suggest using the standard activator for temps for temps from 65-90F and the slow at temps above 90F. Note: "Kameleon Paint" (spelled with a K) is a registered trademark of The Valspar Corporation which neither makes nor endorses the use of our products.